Republican presidential nominee Donald Trump’s debate bombshell hinting that he might contest the results of the Nov. 8 election should he lose has ears perked up at one federal agency in particular. The General Services Administration, under presidential transition laws going back to 1963, is responsible once election returns are clear for ascertaining which party’s candidates are the “apparent” new president-elect and vice-president-elect. And though that sober task became a challenge one time—during the contested 2000 Bush v. Gore election whose recounts extended into December—criteria for making the declaration, veterans of the process tell Government Executive, are left to the GSA administrator. That’s because with only 73 days until the Inauguration, there’s no time to waste in outfitting the incoming team in its new digs with space, equipment and travel funds. " "Consistent with past practice of GSA administrators in Republican and Democratic administrations, [the decision on which candidate will get office space and resources] typically happens in the days immediately following the conclusion of the election," a GSA spokeswoman said. The law “doesn’t say anything about how to decide—it could be tea leaves or newspapers,” said Jim Williams, who as acting GSA chief in November 2008 determined Barack Obama and Joe Biden were the “apparent winners” of that election (pending formal designation by the Electoral College weeks later). Whether Trump issues a concession should not affect the call, Williams said, because of the shortage of time. Sitting in the prepared and secured transition space in Washington on election night, Williams watched the televised returns and decided, at about 11:00 p.m. EST when Obama had 215 electoral votes, that the Democrat was likely to take California and top the needed 270. “I’m ready to sign,” he told staff. So in a ceremony that GSA captured on video, Williams—following some snafus in efforts to re-type three formal messages on GSA letterhead—signed documents addressed to Obama, Republican losing candidate John McCain, and a memo to the GSA’s chief financial officer authorizing the turnover of $6 million of the $8 million designated for transition. “I and the members of the GSA Presidential Transition Support Team look forward to supporting you during this transition period and throughout your administration,” one letter said. McCain conceded the race, and Williams called Obama deputy campaign chief Chris Lu, whose team showed up at the transition space bright and early the next day. In determining the apparent winners, the GSA administrator “doesn’t consider just one thing, but has to look at the whole picture,” Lovelace told Government Executive. This year, if Trump were to lose the vote count and decline to concede, “The White House and GSA would have to evaluate what’s going on, what are the next steps,” she said. 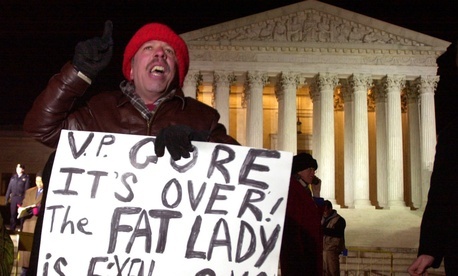 The GSA chief during the roller-coaster drama of the 2000 recount had a rougher time. With Democratic candidate Al Gore having won the popular vote, but the parties in court and the state of Florida conducting a dramatic recount for its prize electoral votes, GSA Administrator David Barram, and later acting chief Thurman Davis, Lovelace recalled, took flak from both parties for refusing to promptly hand over the keys, funds and office space. Cheney added: “This is regrettable, because we believe the government has an obligation to honor the certified results of the election…Therefore, at the direction of Governor [George W.] Bush, we will proceed, drawing on other sources.” The Bush team set up offices within McLean, Va., with its own funds. Next month, presuming there is Election Night clarity on the winner, the document signing ceremony by current Administrator Denise Turner Roth will be held at GSA’s F Street Northwest Headquarters, where permanent transition space is now ready.